Are you looking for an IT services provider, but are unsure what services they can or should provide to optimize the performance of your business systems? In the past, when you called your IT services provider in regard to an issue with your computers, the provider responded by driving over to your office to fix the problem. This model is commonly referred to as “break-fix.” If your business did not keep up with patches, backups, and security, there was a good chance that your business would suffer downtime when your computers were not working. Now that most businesses rely on technology to conduct business, this model is no longer effective. Downtime costs your business money in lost revenue and employee productivity. Managed IT Services enables your IT provider to proactively manage your systems to reduce downtime. With modern technology, your IT provider can perform maintenance remotely, including system patches and upgrades. Preventive maintenance greatly reduces the number of issues you will face with your technology. System alerts tell the Managed Service Provider (MSP) when there is an issue so their team can respond to the issue before it causes downtime, and in most cases before you even know that there is even an issue. Network & Server Management – Operation, administration, maintenance, and provisioning of networked systems and servers are essential to managing your systems. Using IT strategic planning, your MSP also advises you regarding which equipment requires replacement, and facilitates hardware procurement. tributed by vendors, and keeping antivirus software up to date keep your systems running smoothly, reduce cyber-risk, and minimize downtime. 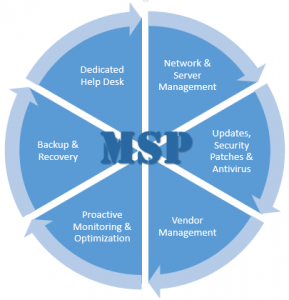 Vendor Management – Your MSP is the one and only number you need to call for all of your technology service needs. Rather than you having to take time away from your business to figure out which vendor is responsible for your IT issues, your MSP diagnoses the issues and works with your third-party vendors to resolve them. Other vendors include your internet services provider (ISP), hardware vendors, software/application vendors, phone services, mobile carriers, website hosting, email hosting, cloud services, etc. Proactive Monitoring & Optimization – Your MSP uses Remote Monitoring and Management (RMM) tools to monitor how your systems – including network devices, applications, security, computers, and servers – are performing. Remote monitoring identifies potential risks and immediate issues enabling the MSP to respond quickly, and often proactively, to optimize performance of your systems. Issues are often identified and fixed before the end-users even know the issue existed. Backup & Recovery – Data backup strategies and procedures are implemented to protect your business from data loss. Backups are tested regularly and consistently to ensure that they are recoverable, which is essential for disaster recovery. Dedicated IT Help Desk – Certified technical professionals, who are focused on your unique environment as their client, are available to provide technical support and resolve user issues. Perhaps the biggest value in using IT Managed Services is benefiting from the MSP’s ability to discover and fix problems before they actually become a problem for your business. Like the physician you go to for an annual physical, Big Idea Technology monitors your systems “vital signs” and performs preventive maintenance to keep your systems healthy. Call us to discover how we can help keep your business systems healthy so that you can avoid IT interruptions and downtime, and instead focus on running your business.